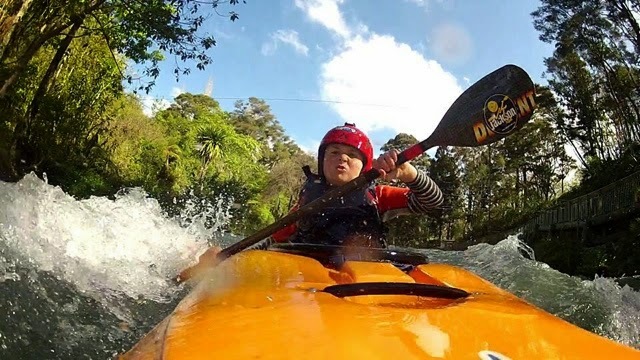 DBP INTERVIEW: the Littlest Big Man in Paddling ~ GAGE AND LEE LAUGHTON | DBP MAGAZINE ONLINE The World's Best Free Whitewater Publication. When I first came across the story of little Gage Forrest Laughton in our Facebook feed, I had to look twice. Seven years old (at the time)?Amazing! And this little guy isn’t just sending a stout, he’s busting out the old school paddle toss move like a boss! His Dad Lee was a fan on the Dirt Bag Paddlers page, and we quickly struck up a conversation. Turned out Gage and Dad loved our whitewater philosophy and enjoyed the entertainment on the page (at least the clean stuff wink wink). We were stoked when we saw that Gage, with Lee, had set up an Athlete page on Facebook, and when we saw that his 8th Birthday was just around the bend, we made sure to post our congratulations. Then we noticed… This little guy has quite the following! DBP: So tell us where you guys are from. What is your home river? Please describe it for those of us who’ve never been to New Zealand. LEE: I was born in California and grew up in the outdoors of the Sierra Nevada Mountains, and moved to New Zealand at the age of 15. 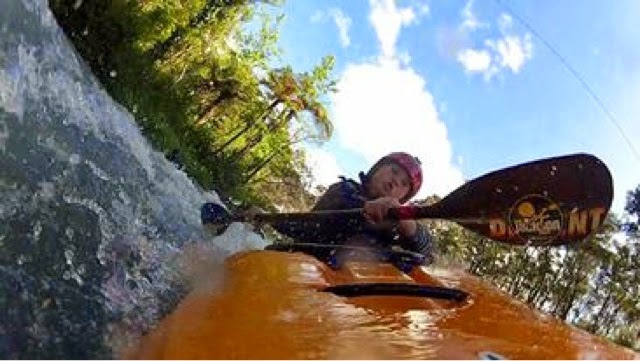 At the age of 18, I went rafting down the Wairoa River and realized this was the life I was missing, Three weeks later, my dad helped me buy my first kayak and 29 years laters , I am still hard at it and getting to share the experience with my children. Gage and his sister Darcie were both born in New Zealand. We live 1 hour north of Auckland (NZ’s largest city) in a small rural dairy farming community. We live on the Hoteo River which runs right past our drive way but,sadly, unless it is in flood, its only good for fitness training. The river we frequent the most is the Tarawera River. The Tarawera is a 4 hour drive for us and is located in Kawerau, the Bay of Plenty region of NZ. This river is amazing and caters to all abilities, from easy river trips to technical sections including 2 slalom sites. It was the home of the 2013 IRF World Rafting Championships. DBP: Gage, we understand your friends call you Gump. It’s amazing to see a young fella like you getting after it on the river! Dad, how old was he when you first said “let’s go paddling?” Does the whole family get out together? 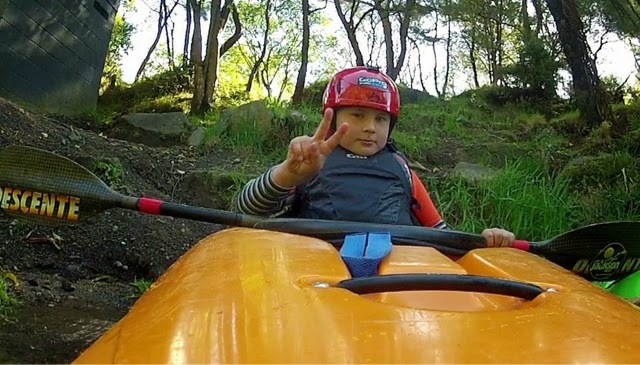 LEE: Gage was 5 when he first showed interest in all my old kayaks in the barn. I finally said “lets go” soon after he turned 7 . I was waiting for him to be able to swim properly and with confidence. The first trip away was on a small lake and both Darcie (12) and Gage enjoyed it, but soon got bored. 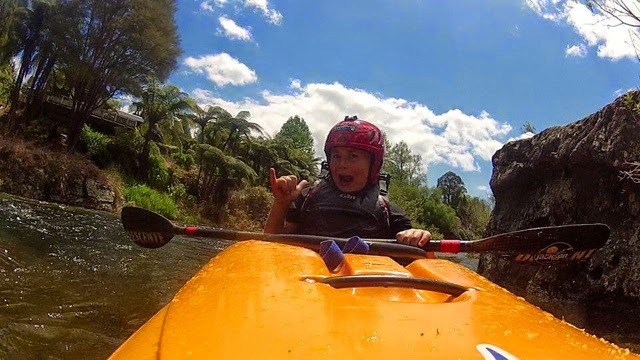 Two weeks later I took them both to the Ohinemuir River in the Karangahake Gorge (2 hours SE of Auckland) and both were just buzzing at the chance of paddling class 1 water and doing small rapids. Ever since that day, the two of them have never looked back. The excitement of kayaking has them both hooked. DBP: How quickly did Gage progress in the sport? Were you surprised or worried when he first said to you he wanted to run a waterfall? 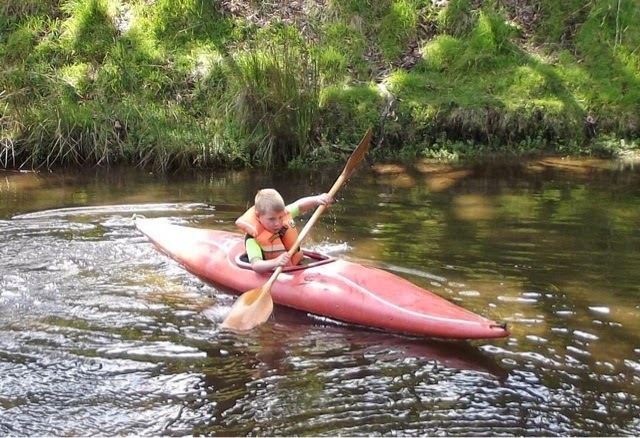 LEE: Gage took to kayaking like a duck to water. His progress (like his sister’s) was almost too quick to keep up with. When I wasn’t trying to teach him things on the water, he was on YouTube watching Ben, Rush and Rafa and then copying their paddle strokes next time we went on a trip. I started him off slowly on small rapids but he was always asking, “can’t we do a bigger rapid dad?” So we did bigger,and bigger, and BIGGER! and he still kept asking that same question. 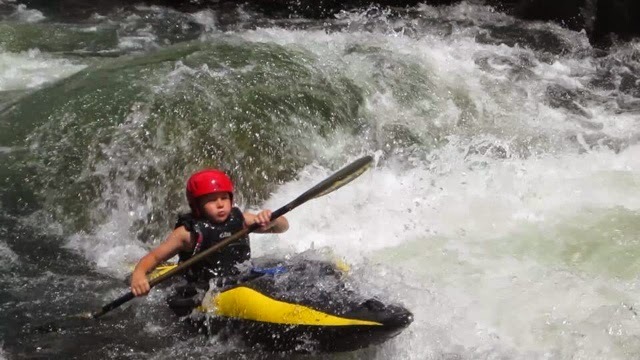 Gage is a very big 8 year old and has a lot of power in his arms already, but I have had to slow him down and control which rapids we do as he has the courage to run rapids that got me nervous when I was in my 20’s. I wasn’t really surprised when Gage finally asked to run his first waterfall, as he had been watching his heros daily, paddling over huge drops on YouTube. He always makes me go first when we do a waterfall and he stands on the bank watching. I thought he was nervous but when I asked him why doesn’t he get in his boat and follow me, he replied ” I can’t see your line as well from on the water and I want to know where I need to go.” How could I argue with that? GAGE: Mom was a little worried when she first found out Dad was taking us down rivers but she used to paddle with dad and knew he was pretty good at it and safe. DBP: Gump, what did YOU think the first time you got set to run a waterfall? Were you scared? How did it go? GAGE: I was excited to do it until we got to the river. I made Dad do it 3 times and then finally did it. I was really scared but once I did it, it was easy, so I did it again! 5 times I think in the end. DBP: Gump, what is your favorite thing about kayaking? Do you have a favorite rapid, and if so can you describe it for us, Lee? GAGE: Its fun and exciting! I love big bouncy rapids, its like a roller-coaster, but more fun. 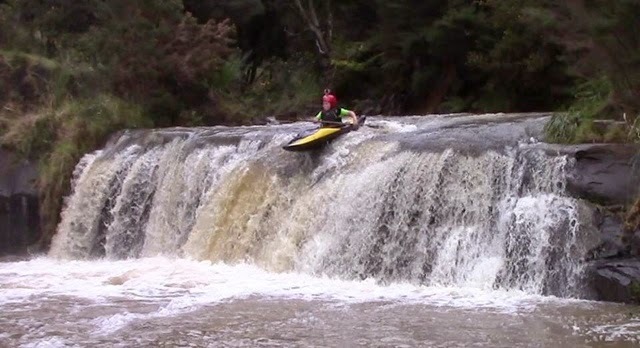 LEE: Gage’s favorite rapid would be the slalom course section on the Tarawera River. It is about 600 meters long and starts off with a simple grade 2 and quickly graduates to a good solid grade 2+ , with plenty of big waves, drops and a couple of very large holes near the bottom. DBP: What type of paddle and PFD does Gage use? How is the Liquid Logic Remix working out? And what kind of kayak is that black and yellow model? The black and yellow boat is a Eskimo Kendo and was sold to us by friends as it was the best boat at the time to suit gage and only weighed 15 pounds, which made it light to carry and very responsive on the water. The Remix has been great for Gage. I’m really impressed with all the Liquid Logic boats and their design. Gage’s sponsor, Michael Burgin, owner of Top Catch Whangarei, tried him in a couple of boats and the Remix suited him the best. The front deck is lower, allowing him to paddle easier. I also added an inch of foam to the seat to allow him to sit a bit higher. Gage has quickly gotten used to handling the Remix and is really enjoying it. Gage’s PFD is nothing special and is only a cheaper brand. I looked at some of the top named PFDs but at the time, nothing would fit him properly. His paddle is a second hand carbon kevlar with no name and the blades have been ground down to make them smaller so he isn’t pulling so much water. Michael Burgin is currently organizing Gage a new crank shaft CORE paddle. DBP: You are becoming a pretty famous 8 year old, buddy! Were you both surprised when top pro kayaker Rafa Ortiz reached out to you? What did he have to say? LEE: Rafa’s message, was that a complete surprise!!! I discovered it while I was at work and couldn’t wait to pick the kids up after school and tell them. I told Gage while we all sat in the car on the way home and all he did was sit there as quiet as a mouse with the biggest smile you could ever imagine. I had never seen him so quiet yet so happy and pleased with himself. His hero had posted on his Facebook. What more could you ask for? GAGE:Rafa said ” keep crushing it bro !” so thats what I will try and do. DBP: Lee, was there any hesitation about putting Gage out there on social media? Any advice for other dads out there? LEE: I personally had no hesitation. Everything I have put out there has come back positive and with huge support world wide. I couldn’t have asked for a better response. Kayakers are good people, both for others and the support needed to help grow the sport. If Gage was involved in a different sport, I would maybe have to assess the situation differently. DBP: Gump, who is your favorite paddler in the world? DBP: We were pretty stoked when you guys first approached us, Lee, and we’re glad to feature you guys. What does the future of kayaking hold for Gage? Where can we follow his exploits online? LEE: I have to say a big thank you to everyone at Dirt Bag Paddlers for all your support. It has been terrific! When this journey started just over a year ago, who would have known it was going to get this big? I was just a solo dad taking his kids paddling. Most 8 year old boys want to be a fireman or policeman. Gage’s dream is to earn the right to wear a RED BULL helmet and do GoPro videos. Gage said he won’t give up paddling until he does. We try to get away on trips at least once a month and with summer now upon us, we will be getting out there a lot more! DBP: Gump, what’s your favorite part about Dirt Bag Paddlers? We are proud to call you one of us! GAGE: I like all the videos of people doing big drops and rapids and all the funny pictures. DBP: Any last words, boys? LEE: I have to give Darcie a big thank-you!!! Darcie is often behind so much of the camera work we do on the rivers…. she tells Gage to wait or go depending on the sunlight and what she believes will become a good shot or video and is often operating 3 cameras at once that are placed on tripods along a stretch of rapid all on her own… ( pretty damm good for a 12 year old!) .She is then here in the office with me editing all of Gage’s stuff. Michael Burgin of Top Catch Whangarei for his help, support and sponsorship. We are so grateful for everything he has done. Jono Smith of Kawerau NZ, for his help and great support while on and off the rivers. Dirt Bag Paddlers for their continuous ongoing support. Paul Carrico and PNW Kayakers for believing in Gage from the start and your wonderful support. A big thanks to all our family and friends and to every Dirt Bag Paddler world wide. Without all of you, we couldnt have done this !! This includes you too Taryn Smith and Steve Laughton!!! During this time of year, as we approach Christmas and New Year’s, we think of thankfulness, of giving, of hopes for the coming year. We also reflect back on our youth, and see the promise of the future in the eyes and the hearts of the little ones… Gage, your story makes us all smile, think back on our own childhoods past, and feel glowingly confident for what is to come. Our sport is in good hands. MERRY CHRISTMAS AND A HAPPY HEALTHY NEW YEAR TO ALL from DIRT BAG PADDLERS!! What an amazing kid! Good on you, Gage, and keep paddling. Thanks for featuring this awesome family – love the story. THE RIVER NOW FLOWS TO A NEW BEAT ~ Dion D’Lucia teams up with littlest DBP Admin Gage Forrest Laughton. by Lance Sebastianwith Alan Williams - DBP MAGAZINE ONLINE The World's Best Free Whitewater Publication.